As a woman journeys through life, her breasts are likely to encounter many changes in shape, size, and composition. If a lump of any sort becomes apparent, this can understandably cause great concern and upset - and for this reason it is advisable to enhance your knowledge about what a lump can mean. Breast cysts are far more common than is generally realized; read on to find out about how to recognize a cyst, and what - if anything - you should do about it. A cyst in the breast is a small lump or sac that is filled with fluid. They can develop in one, or both breasts, and it is possible for more than one to exist. Generally, they feel soft and pliable; however, sometimes they might be firm, but they usually do not require treatment unless they cause pain or discomfort. 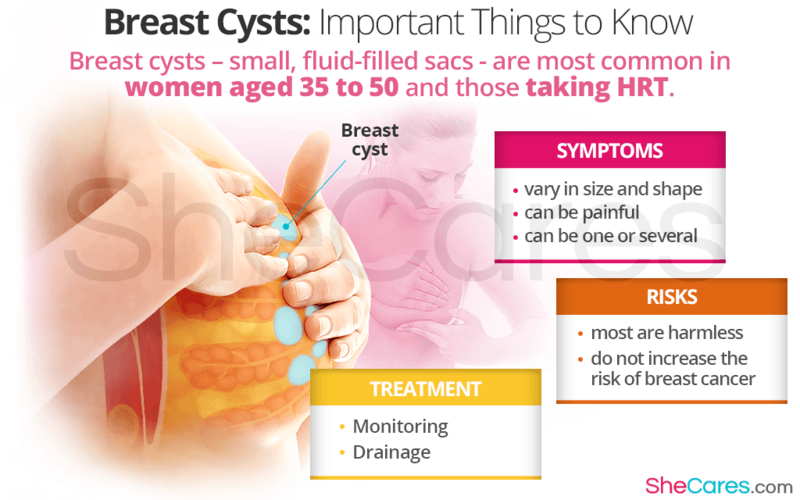 Breast cysts are most commonly seen in women aged between 35 and 50, and in menopausal women who use hormone replacement therapy (HRT). Upon discovering a lump in the breast, unsurprisingly the first concern of most women will be “is it cancer?” Fortunately; however, this is rarely the case. While it is advised that any changes or lumps are checked by a doctor, it should be comforting to know that the likelihood of a cyst being cancerous is considerably low. Having said this, one aspect to be aware of is that the presence of a cyst in the breast can sometimes mean that other changes or lumps go unnoticed - so it is important to know your breasts thoroughly, and frequently check them. Research has revealed that over half of the population of women will experience fibrocystic breasts in some form during their life. The condition refers to when the tissue that makes up the breast becomes firm and nodular, and might be noticeable visibly and to the touch. This state is perfectly normal, and rarely requires treatment. Finding a breast cyst can be unsettling, but armed with some knowledge about them you should hopefully be reassured that usually do not present a threat to your health. In spite of this, it is important to regularly check your breasts for lumps and have them examined by a doctor as early as possible.